The must-have DVD ripping tool for all Mac users. 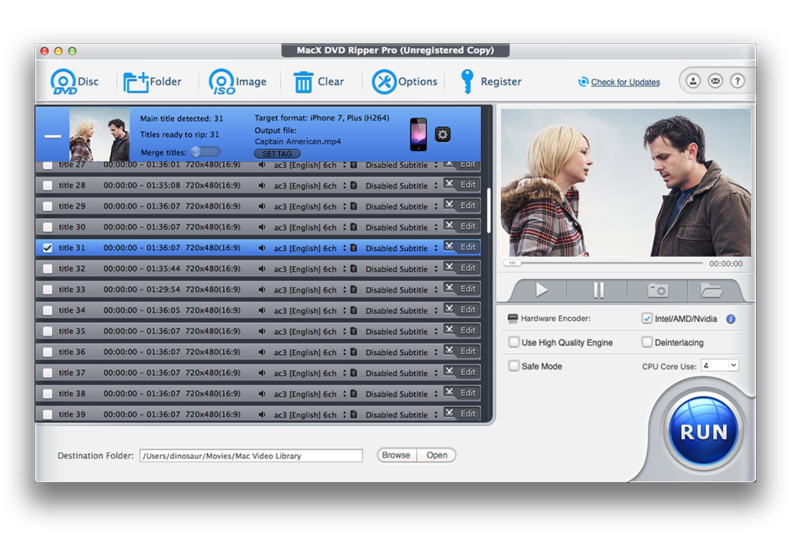 It helps rip and copy all types of DVDs to all popular video/audio formats, making DVD playable on iPhone iPad Android, etc. What's more, this DVD ripper bypasses any latest DVD copy protections and owns the fastest speed in the world. A full DVD can be ripped in only 5 minutes! Support to rip DVD movies to all sorts of popular video and audio formats, such as MP4, H.264, MOV, M4V, AVI, QT, FLV, MP3, etc with the fastest speed. The built-in DVD decrypter bypasses DVD copy protections of all types of DVDs, the software constantly upgrade to rip the latest-released DVD movies. Convert DVD movies for playback on all types of multimedia devices including iPhone, iPad, iPod, Apple TV, Android, Amazon Kindle, etc or store them on Mac/hard drive. * The pricings are only available on this webpage. Time-limited offer! Hardware acceleration tech moves video processing from CPU to GPU, which boosts the running speed greatly. 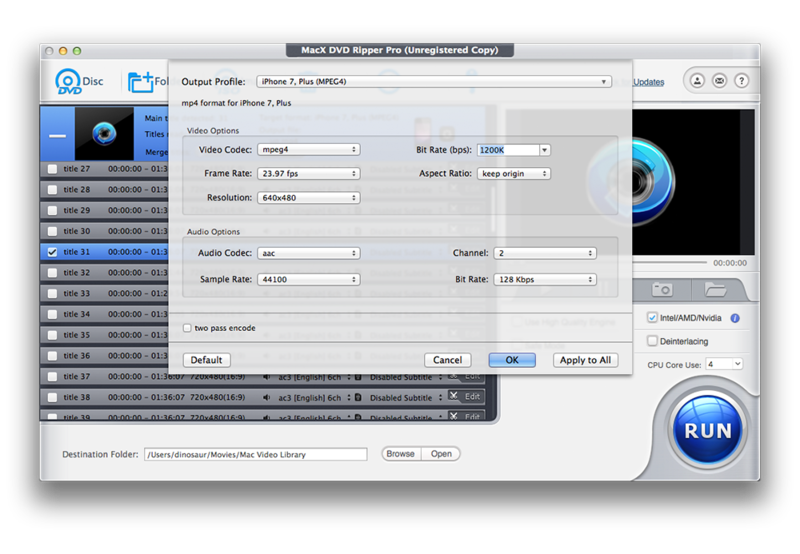 And the new MacX DVD Ripper Pro is the First & Only DVD ripping tool which supports the unique Level-3 Hardware Acceleration tech currently. Compared with other rippers that only utilize hardware acceleration for video encoding, MacX extends this tech to video decoding and processing, powered by Intel® QSV, Nvidia® (CUDA/NVENC) and AMD. With the assist of Level-3 Hardware Acceleration tech, MacX DVD Ripper Pro is proud to converts DVD at 5X faster speed with lossless quality! Free lifetime upgrade to future version. 30-day money back guarantee. Update constantly to rip all the latest copy-protected DVDs for fair use. Hollywood movies, 99-title DVD, TV series DVDs, workout DVDs, Japanese discs, etc. DVD to MP4, H.264, MOV, FLV, MPEG4, AVI, QT, MP3, etc. DVD to iPhone X, iPhone 8, iPad, Samsung Galaxy, Huawei Mate 10 etc. MacX DVD Ripper Pro gives new life to my DVDs which were bought years ago. Now I can enjoy those classic DVD movies again and again on my iPad and share them with my friends. The operation steps are quite easy for computer idiot like me. It is the fastest DVD ripper I’ve ever used. MacX DVD Ripper Pro is the best choice for people who hates the endless waiting like me. I was troubled by DVD encyptions before I found this useful tool. no matter old or new DVDs. 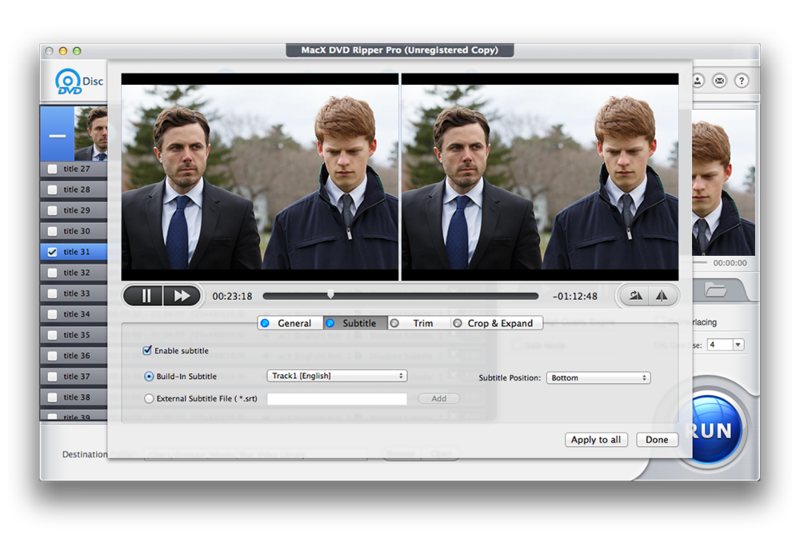 2017 Top Free DVD Rippers for MacReview of MacX DVD Ripper, HandBrake, MakeMKV, etc to better know how they work. 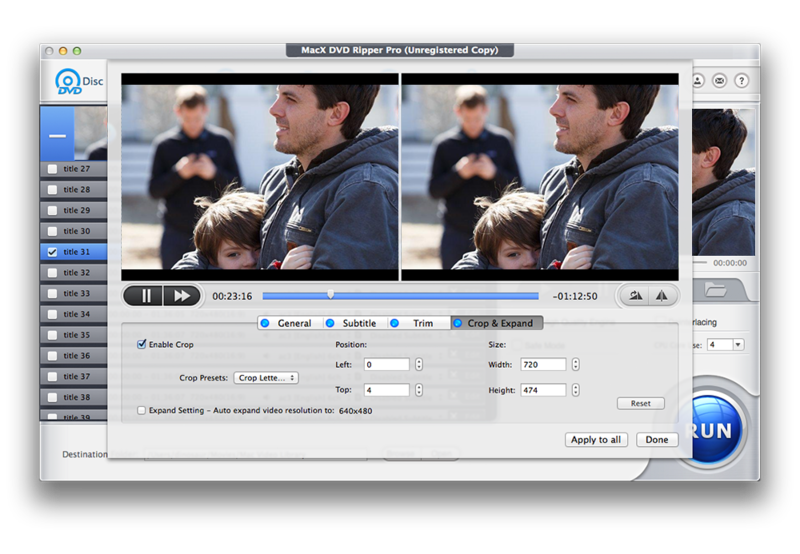 Guide to convert and rip DVD to MP4 for iPhone, iPad, iTunes, QuickTime and Android. The post is about how to backup DVD to hard drive for easier storage or playback on other devices. Rip Protected DVD on Mac for FREE Follow the guide to deal with protected DVDs if you encounter any DVD rip errors. Note: You can enjoy 3-month free upgrade from the date you activate the license code. DVD ISO image, MPEG-2 (DVD), MKV, MP4, QT, MOV, M4V, FLV, H.264, MPEG4, AVI XviD/DivX, MTS, TS, M2TS, etc.